The proof by Lindemann that pi is transcendental is one of the crowning achievements of 19th century mathematics. In this post, I would like to explain a remarkable 20th century proof of the Lindemann-Weierstrass theorem due to Bezivin and Robba [ Annals of Mathematics Vol. 129, No. 1 (Jan. 1989), pp. 151-160], which uses p-adic analysis in a key way. Their original argument was made substantially more elementary by Beukers in this paper; we refer the reader to [American Mathematical Monthly Vol. 97 Issue 3 (Mar. 1990), pp. 193-197] for a lovely exposition of the resulting proof, which rivals any of the usual approaches in its simplicity. But I’d like to focus here on the original Bezivin-Robba proof, which deserves to be much better known than it is. In the concluding remarks, we will briefly discuss a 21st century theorem of Bost and Chambert-Loir that situates the Bezivin-Robba approach within a much broader mathematical framework. (L-W) Let be distinct algebraic numbers. Then are linearly independent over . A relatively simple argument shows that (L-W) is equivalent to a rather different-looking assertion about formal power series which are represented by rational functions. the power series expansion for around . We will be particularly interested in functions for which (i.e., which vanish at infinity). We say that a formal power series is analytic at if the power series has a nonzero radius of convergence around . And by abuse of terminology, we say that is a rational function if there are polynomials with not identically zero such that the power series expansion of around is equal to . A rational function vanishes at infinity if and only if . (B-R) If is analytic at infinity and is a rational function, then is also a rational function. Note that the conclusion of (B-R) can fail for functions with an essential singularity at infinity; for example, but is not a rational function. (This is just the extension of the usual Laplace transform to the setting of formal power series.) The map is clearly a bijection. (L1) defines an entire function of exponential growth (i.e. for some ) if and only if is analytic at infinity. (L2) is the power series expansion around of an exponential polynomial if and only if is a rational function. This gives a bijection between exponential polynomials and rational functions vanishing at infinity. To see that (L-W) implies (B-R), suppose is analytic at infinity and is a rational function. By (L2), there is an exponential polynomial with the distinct algebraic numbers and such that . The function satisfies , so by the Lemma we have . As is analytic at infinity, we know by (L1) that is entire, and hence . By (L-W), we must have , i.e. , for all . Thus is also an exponential polynomial, which implies by (L2) that is a rational function. which has only simple poles. Moreover, since the are distinct and we must have and some is non-zero; thus has at least one simple pole. On the other hand, since , the function is entire and of exponential growth, so by (L1) is analytic at infinity. The Lemma tells us that , so has only simple poles. However, it is easy to see that if is a rational function then can never have a simple pole. Thus is not a rational function, contradicting (B-R). In order to prove (B-R), we need to show that if is analytic at infinity and is a rational function, then is also a rational function. For this, we need some kind of robust criterion for determining whether a formal power series with coefficients in represents a rational function. There is a long history of such results culminating in what one might call the Borel-Polya-Dwork-Bertrandias criterion, which will turn out to be exactly what we need. We interrupt our regularly scheduled proof to give a brief history of these developments. Around 1894, Emile Borel noticed that if is a power series with integer coefficients defining an analytic function on a closed disc of radius in , then must in fact be a polynomial. This is a simple consequence of Cauchy’s integral formula, which shows that if on the disc then . Since the are assumed to be integers, the inequality implies that for all sufficiently large . Theorem (Borel): If is the power series expansion around of a meromorphic function on a closed disc of radius in , and the coefficients are all integers, then is a rational function. (R1) represents a rational function. is zero for sufficiently large. The idea behind the proof of the more general result of Borel is to use the above Cauchy estimate (applied to the product of with some polynomial), together with standard facts about determinants, to show that if is meromorphic on a closed disc of radius then as . If the are all integers, this forces for sufficiently large. 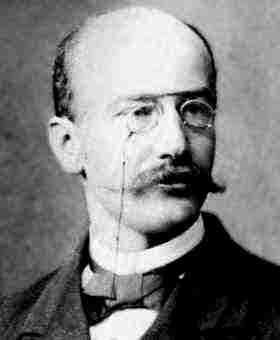 Around 1916, George Polya realized that the proof of Borel’s theorem via Kronecker-Hankel determinants could be generalized by replacing the radius of convergence with the transfinite diameter of the region of convergence. The transfinite diameter of a disc in any algebraically closed normed field (e.g. ) is its radius, and the transfinite diameter of a real line segment is one-quarter of its length. It will be convenient for the statement of Polya’s theorem, and for our application to the Lindemann-Weierstrass theorem, to work with instead of in Borel’s theorem, and to study the transfinite diameter of the complement of the region of convergence. Theorem (Polya): If is a power series with integer coefficients which can be continued to a meromorphic function on the complement of a bounded set containing with , then is a rational function. The condition in Polya’s theorem is sharp: the series has integer coefficients and can be extended to the analytic function on the complement of the real segment , which has transfinite diameter equal to 1. However, is not a rational function. (D1) For , for all (i.e., is a -adic integer). (D2) For , extends to a meromorphic function on a disc of radius in and . Then is a rational function. It follows that for sufficiently large, and is a polynomial. The transfinite diameter makes sense in any metric space, and in particular we can define it for subsets of the “p-adic complex numbers” . Bertrandias put several of the above ingredients together and proved the following common generalization of the theorems of Borel, Polya, and Dwork around 1963. (B1) For , for all (i.e., is a -adic integer). (B2) For , extends to a meromorphic function on the complement of a bounded set (which is assumed to be a finite union of discs if is non-Archimedean) and . The proof is based on Kronecker-Hankel determinants and the product formula, like the proof of Dwork’s theorem above. For simplicity we have assumed that the lie in , but the statement and proof of Bertrandias’s theorem generalize easily to any number field . We will only use the special case of the theorem of Bertrandias in which each extension of is assumed to be analytic. We are finally ready to explain Bezivin and Robba’s proof of assertion (B-R), which as we have seen implies the Lindemann-Weierstrass theorem (and hence the transcendence of ). Perhaps the most interesting aspect of the proof is that it is the p-adic places which will be used to verify the hypotheses of Bertrandias’s theorem. Let be a finite set of places of containing the Archimedean place such that for , all of the nonzero and have p-adic absolute value 1, and such that for all . The explicit formula (*) shows that for the coefficients of are -adic integers. Thus satisfies hypothesis (B1) for any set of places containing . For , formula (*) shows that the series defining converges outside a disc of some positive radius . For this choice of , satisfies both (B1) and (B2) and thus is a rational function. Q.E.D. 2. In their paper, Bezivin and Robba generalize assertion (B-R) to an arbitrary linear differential operator with polynomial coefficients for which is a totally irregular singular point. In the special case , the proof is significantly simpler than the general case because one has an explicit inverse operator. In the general case, one needs to use techniques from the theory of -adic differential equations to establish the properties (B1) and (B2). 3. The converses of the theorems of Borel, Polya, Dwork, and Bertrandias are clearly true as well, so these results give a precise characterization of rational functions among formal power series of a certain type. 4. A proof of the theorem of Bertrandias appears in Chapter 5 of Amice’s unfortunately out-of-print book Les Nombres p-adiques. 5. For a deeper understanding of p-adic transfinite diameters, it is very useful to work with Berkovich spaces. See for example my book with Robert Rumely, in which we prove (as in the classical case) that the transfinite diameter of a compact set coincides with its capacity, defined in terms of a probability measure of minimum energy supported on . Theorem (Hartshorne): Let be a complex projective surface and an ample effective divisor on . Then any formal meromorphic function along is the restriction of a rational function on . This entry was posted in Arithmetic geometry, Oldies but goodies, p-adic analysis, Transcendence theory and tagged Lindemann-Weierstrass theorem, rationality criteria, transfinite diameter. Bookmark the permalink.